I look forward to traveling with my wife and catching up with other areas of my life in the coming months, but retiring from Learning Matters is not a hard stop for me. I have one more report to finish for the NewsHour, and our new film, “School Sleuth: The Case of the Wired Classroom,” will be on most PBS stations in November. My passion and desire for engagement remain strong. Rather than putting myself out to pasture, I hope to keep active as a moderator, an activity I love, and seize other opportunities and adventures that await, out of sight and around the corner. I’ll be weighing in on critical issues in education in Raleigh-Durham in August; DC in September; and Chicago in October. Will we hold charter schools, both for-profit and not-for-profit, accountable for their spending and their educational outcomes? If the resistance to over-testing continues to grow, how will that change what happens in schools on a daily basis? Will technology be used to let students soar and explore, or will educators harness it to improve management of information and fact-based learning? Will leadership emerge that will help develop sensible ways of assessing schools, students and teachers — and in so doing drive a stake through the heart of ‘test-based accountability’ that is playing gotcha with teachers? How will the new Elementary and Secondary Education Act, when it eventually replaces the much-detested No Child Left Behind, change the power dynamics between Washington and the states? Friends have asked me what I will miss most. That’s easy: the challenges of reporting and the joys of teamwork. Television is truly a team sport, and I have been blessed with wonderful teammates. Because it’s my face and voice that have been in your faces and ears, I’ve received more credit and attention than I deserve. I hope that, at 74, I am mature enough to cope without the attention. By now, blogging has become second nature to me, and I will continue to post at least weekly. I invite you to take a look at my new blog, The Merrow Report. (Fun fact: This was the name of my original television series back in the 1990’s.) You will find it at themerrowreport.com. My departure is not a hard stop (or any sort of stop at all) for Learning Matters and its reporting for the NewsHour. Within a few days, expect an announcement. I’m thrilled that my talented colleagues will continue to do the work they love, and I am extremely grateful that a number of leading foundations are supporting this enterprise. In later posts I will weigh in on current issues and trends, while also reflecting on the past 41 years of interviewing teachers, students, Secretaries of Education and others in America’s most important venture. As I sign off, please know that it has been a rare privilege to report for you. I appreciate your trust, and I pledge to do my best to preserve it, whenever our worlds connect. Addio per ora. I look forward to hearing from you. 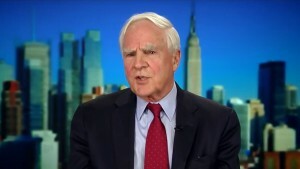 Left: John Merrow on a recent PBS NewsHour. The longtime public media journalist announces his retirement. 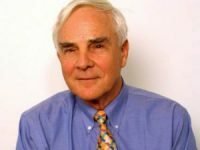 John Merrow began his career as an education reporter with National Public Radio in 1974 with the weekly series, “Options in Education,” for which he received the George Polk Award in 1982. He is currently President of Learning Matters and scholar in residence at the Carnegie Foundation for the Advancement of Teaching at Stanford.